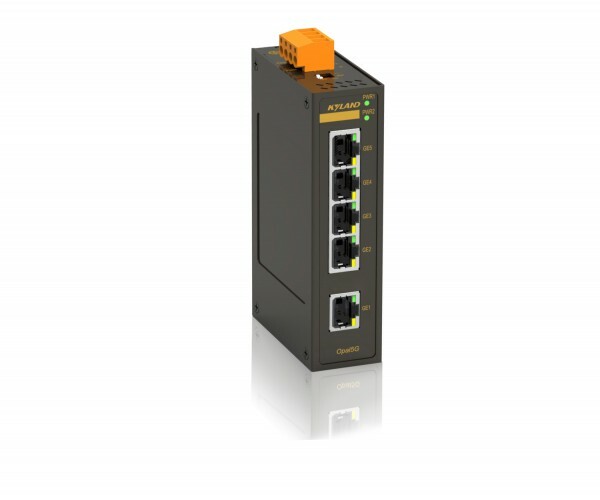 Opal5G series, Kyland produced 5-port unmanaged switches, are characterized by its full Gigabit interface, compact size, economical and plug-and-play design, generally used to connect the high bandwidth Ethernet in factory automation, petrochemical, ITS, and other applications. Opal5G support 5 10/100/1000Base-TX RJ45 ports, along with metal housing with IP30 protection class, thus ensuring fast and reliable data transmission in harsh industrial environments. The two DIP-switches located on the top of the device are used to enable/disable Broadcast Storm Protection (BSP) function and Jumbo frame transmission function, respectively. Opal5G provide both standard (-10°C to 60°C) and wide (-40°C to 75°C) operating temperature range models to meet different applications. Weiterführende Links zu "Kyland Opal5G-E-5GE-LV-LV"